The sun is shining over the emerald green rice field, the breeze playing gently with the delicate crops. Under the shade of the coffee shop near Ubud in beautiful Bali, we enjoy a cup of kopi luwak or civet coffee, freshly brewed. We just discovered that this is the most expensive coffee in the world. After visiting the coffee plantation, we can understand why. It is not due to its taste, which is not so unique after all, just less bitter and aromatic with a hint of chocolate undertones. Nor is it because of the legend that this unique coffee will increase fertility. It’s due to the uncommon method of producing this coffee, that is really quite an experience in itself! The story of the priciest coffee in the world is quite humble and goes back to the early 18th century, when the Dutch established coffee plantations in their colonies in Indonesia. Civet coffee, or kopi luwak in Indonesian, was discovered by plantation workers. Forbidden from using coffee beans collected from the plants, they picked up, cleaned and then roasted the beans defecated by wild Asian palm civets that entered the plantations at night to eat the ripest coffee berries. The civets’ digestive systems gave kopi luwak a uniquely rich aroma and smooth, rounded flavor. Soon, the Dutch plantation owners themselves became fans. Our guide leads us through the hilly plantation amongst high avocado and mango trees, lushly pepper plants, vanilla vines with striking flowers, and precious pods and of course coffee plants with their green and red berries tangling like rubies from the branches. Genuine Indonesian Kopi Luwak is still gathered from the droppings of the civet called the luwak, a shy, solitary nocturnal forest animal that roves the coffee plantations at night. We learned that coffee beans are seeds and not beans. They contain caffeine as a plant defense against animals. However, this is no protection against the palm civet cat. 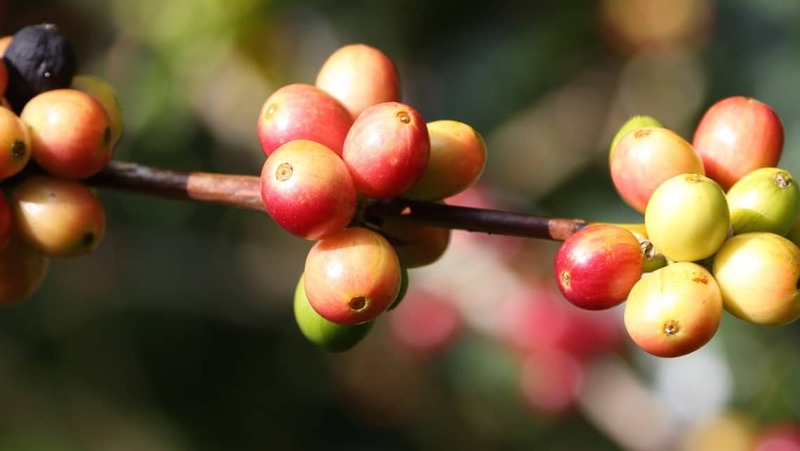 The coffee berries are one of its favorite food. We found out why by tasting one ourselves. Its fleshy pulp has a sweet and soft taste. The seed is definitely as hard as a stone. During the digestion process, these stones are not digested. Some kind of unique fermentation occurs. This gives the civet coffee its special flavor. After about 24 hours the coffee beans are eliminated by the civet. In Southeast Asia, these feces are considered golden. 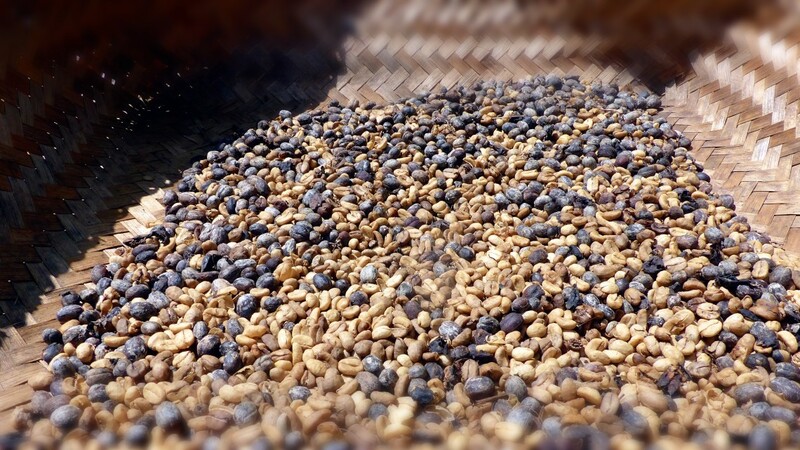 They are collected from farmers, thoroughly washed, sun dried, pounded to remove the skin, sorted and finally roasted. Our guide walks us through the different steps of the production process. The sun dried beans are a nice browny color, almost the same color as the large bamboo baskets they are layed in to dry. A man near a small fire shows us how to slowly roast the beans. Too rare and not easy to collect, the kopi luwak is not a commercially viable crop, but just an interesting coffee curiosity. That’s what attracted us in the first place. And oh! The nice shady terrace overlooking the rice paddies was definitely the icing on the cake ! The tour ended at the shop like most popular tours and we bought some Kopi Luwak and local teas such as the popular ginger tea to bring back as gifts. Later, back home, I wanted to buy more luwak coffee and discovered that there is quite a controversy about it. While there are some ethical suppliers of hand-gathered civet coffee, recent investigations, both by journalists and animal-rights activists, have revealed a cruel and greedy industry. So please pay attention when buying Luwak coffee. The keywords you should be looking out for are “animal friendly” and “authentic”. This should not stop you from trying the poop coffee and making your own opinion ! One Response to "Food Postcard: Kopi Luwak aka Civet Coffee"